Nearly a thousand people laugh heartily together for half an hour every morning in a park in Shenzhen, south China's Guangdong Province. The Guangzhou Daily took a closer look at those happy people. They are members of a group named Laughing Club, and when they get together, all they do is laugh. Zhang Lixin, the initiator of the club and dubbed the 'laugh leader', told the paper that he himself benefited from laughing. He started after he read some advice in a book and tried giggling after quarreling with his wife to relax. After laughing for a few days, Zhang found himself more outgoing and relaxed. Soon his wife joined him, bringing the family more laughter and causing less bickering. When he got to know a kind of 'laughing yoga' is good for the health, Zhang went to Bombay to learn from locals, and, integrating with Chinese medicine, developed what he learned into more than 30 ways of laughing. The 'lion bellow' is to shout with the fingers outstretched near the ears. There is the 'open mouth laugh', the 'bow-pulling laugh', the 'welcoming laugh' and even the 'quarreling laugh', with different arm motions of every laughing manner. 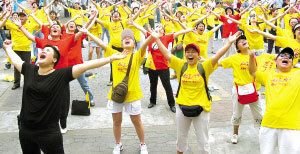 The 'laugh movement' swept over Shenzhen in a matter of months, attracting tens of thousands of people to join, and has spread to nearby cities such as Guangzhou. Every morning at the lakefront and at eight pm on every Monday, Wednesday and Friday at the mountain peak square in Lianhua Mountain Park, club members, largely middle aged and elderly people, gather to laugh and scream loudly. An old man surnamed Jin told the paper he has been participating in the laugh sessions since last May, and that he is now more relaxed and better-tempered. Also, his stiff shoulders feel much better as he claps his hands when he laughs. An increasing number of office workers are joining the happy squad. Mr. Wang, a civil servant in Shenzhen's Futian district, said he doesn't have any trouble sleeping after one of the laughing sessions. Some companies have caught on to the laughing movement and have approached Zhang to train their staff. Zhang believes laughing provides people with an easy way to de-stress from the pressures of modern society and work, which is why he is trying to popularize the pastime.